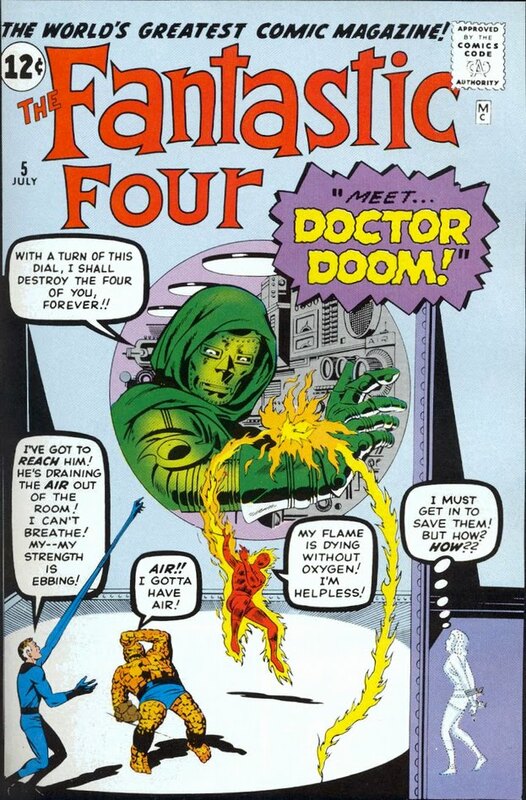 I should have lots to say about this issue; after all it contains the first appearance of arguably the single most significant and enduring villain in the Marvel Universe – Dr Doom. However, I’m having trouble getting past the fact that Doom throws a large electrified net over the Fantastic Four’s skyscraper headquarters and so they just give up. Seriously, what? Rather than fight back or try to escape they just give him Sue Storm. Okay, once you get past that there’s actually a decent little time travel story here. Dr Doom sends the Fantastic Four (well, three of them, Sue’s busy being held hostage) back in time to retrieve Black Beard’s treasure for him…only it turns out that The Thing was actually Black Beard! So…if Dr Doom hadn’t sent them back in time, there would have been no Black Beard, so this had to happen and always happened. It’s the use of time travel which most makes sense, and I tend to like stories like this. Of course, Marvel have since had to establish an elaborate explanation for time travel in the Marvel Universe which includes the existence of multiple alternate timelines, but, hey, it’s early days yet. Sue saves the day in the end, but only because Dr Doom has forgotten about her, rather than, you know, through her actually being any good at anything. Doom’s origin is covered briefly, of course, and is infinitely more satisfying than the one in the recent Fantastic Four movie. Personally I hate when movie adaptations of comics feel the need to tie the hero and villains origins together (I’m looking at you, Batman). Instead Dr Doom’s origin introduces an occult dimension to what has been a firmly science fiction story until now. Yes, Reed and Von Doom are tied together in a way, they were at college together, but unlike Reed, Von Doom couldn’t find the answers he was looking for in science, and so combined his scientific genius with research into occult lore. The results, quite literally, blew up in his face. The question of what Von Doom was looking to achieve is left hanging here, which is a nice touch. Okay, the last thing I’m going to touch on here is another of those nice little in-jokes. 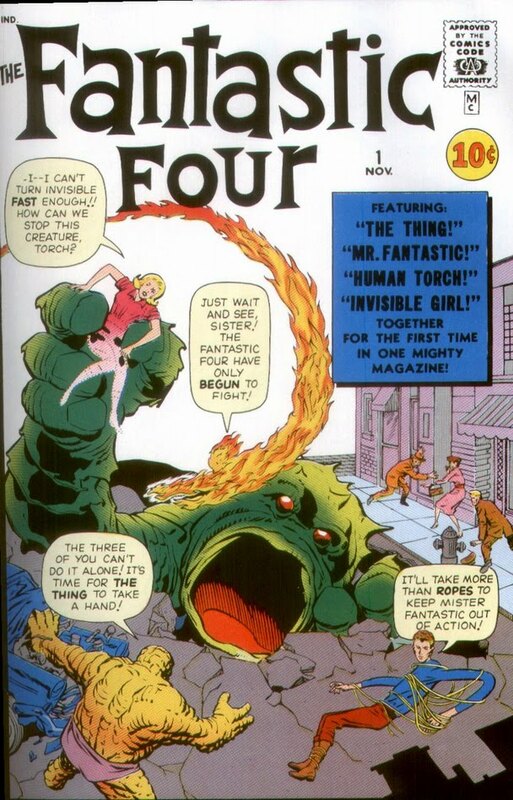 At one point The Human Torch teases The Thing, telling him he looks like the monster in a comic he’s reading, that comic being The Incredible Hulk. The Fantastic Four are clearly unaware of the fact that the Hulk is real…and one is left wondering if they know that there’s a comic about them too? 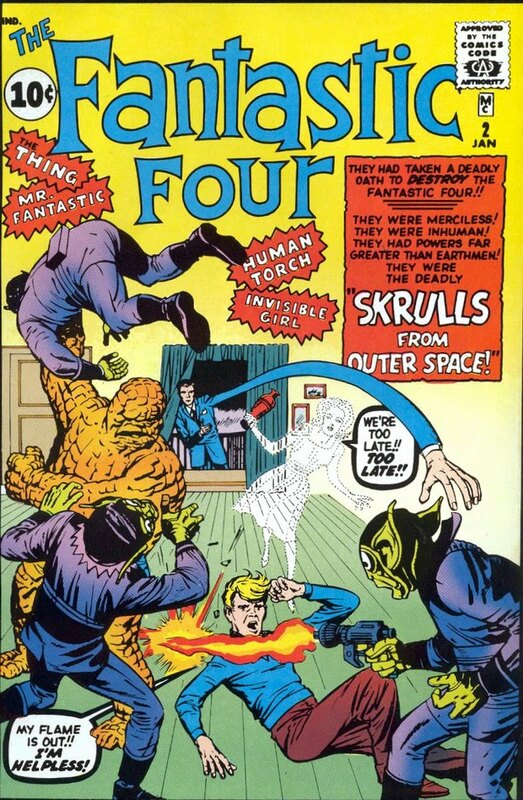 When Marvel unleashed the Fantastic Four onto an unsuspecting world they had already been publishing several monster/sci-fi comics for some years. These included such titles as Journey Into Mystery, Strange Tales and Tales To Astonish. After the success of the Fantastic Four it simply made sense to publish more super-hero stories, and so the focus of the monster books gradually started to shift to include super heroes. 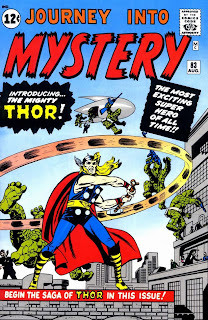 The first title to get this treatment was Journey Into Mystery, which, with issue eighty-three, gave us the debut of Thor! Well, I have to confess that I’ve not read very many Thor comics, and as far as I was aware he’s actually supposed to be the genuine Norse god of thunder, Thor. Not here though, here he’s Doctor Donald Blake who discovers a gnarled stick while hiding from stone men from the planet Saturn when holidaying in Norway. When he strikes the stick against a rock the stick turns into the hammer of Thor and he gains the appearance and powers of the Norse thunder god. He’s still got the mind of Dr Blake though. 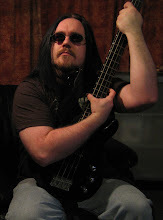 He’s not talking in Shakespearean English, he doesn’t actually think he’s Thor…he just looks like him, and has his powers. I’m pretty sure that Stan Lee changes this over time, but I’m starting to get the feeling that Stan is just making stuff up as he goes along…to meet some kind of publishing schedule… Surely not?! There’s not really much I have to say about this, it’s a fun little story, but most of its fourteen pages are taken up with Dr Blake figuring out what’s happened to him and what his powers are. I’ve already referenced that the Human Torch owes his name and his initial appearance to the character of the same name who first appeared in Marvel Comics #1 in 1939. That comic was, essentially, published by Marvel Comics, although at the time the publishing company run by Martin Goodman was known as Timely. 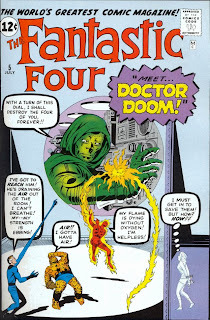 I won’t get into a lengthy debate on the canonicity of stories published by Goodman’s Timely and Atlas Comics prior to Fantastic Four #1, but it’s clear from Fantastic Four #4 that those comics were not only published within the fictional Marvel Universe, but they were regarded as being based on actual events. 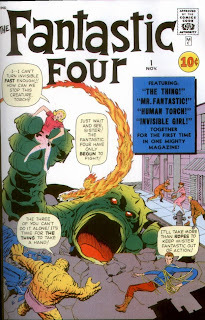 Now, by including the Human Torch in the Fantastic Four, Stan and Jack hinted at a longer history for what was to become the Marvel Universe, it imbued this new and very different kind of super-hero comic with a connection to the Golden Age of super heroes. However, this was very subtle, Johnny Storm is a fundamentally different character to the android Human Torch of the thirties and forties. With the introduction of the Sub-Mariner we see a direct connection to the Golden Age, and in case we’re left in any doubt, we have the Human Torch essentially point to the comics from the forties and say “Look, it’s the same guy!” It’s no coincidence that it’s the Human Torch who finds the Sub-Mariner, either, nor is it a coincidence that at the end of the issue it comes down to a fight between the two of them. Stan and Jack are clearly referencing the many, many fights that the two characters had in the forties, fights which would often see New York consumed by tidal waves as the two titans clashed. Oh, wait, did I say New York? That’s right, with Fantastic Four #4 it’s finally revealed that we’re not in some vague “Central City,” but, instead, we are in the real world city of New York. This is one of the fundamental creative decisions that has, since Fantastic Four #4, set Marvel apart from DC. Where DC has always used fictional cities such as Metropolis and Gotham, Stan Lee chose to set his stories in real cities, in the real world. It’s hard to explain why this makes such a big difference, especially writing from a British perspective, as I am. I’m sure that for American readers it was thrilling to see their heroes battling against a back drop of real world landmarks that they could see every day. I guess from my point of view I’ve just always liked the idea that I could visit these places, whereas I could never go to Gotham City. 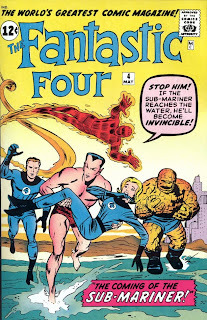 The issue itself follows what is already becoming something of a formula in these early issues – the Fantastic Four bicker and fight amongst themselves before having to come together to fight an external foe who has commanded an enormous monster to attack them. That said, it’s hugely ramped up here, the bickering is taken to such a degree that Johnny has actually quit the team and the rest of the group split up to find him. It is, of course, The Thing who finds him, and the two inevitably end up in a full on fight. The monster, too, has been taken to the Nth degree, as he’s not just big, he dwarfs New York, and is only defeated when The Thing straps a nuclear bomb to his back and walks deep inside the beast to set it off. Not only that, but The Thing has to fight huge sea monsters that are living inside the main monster. This is storytelling on an epic scale, and as absurd as it may be, nearly fifty years on it’s still quite thrilling. We all know this one, right? 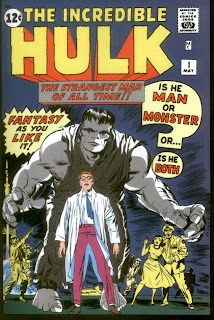 Dr Bruce Banner gets caught in the explosion when testing his Gamma Bomb, and subsequently transforms into a giant, unthinking, green beast whenever he becomes angry. Except, none of that is right, except the bit about the Gamma Bomb. Not only is the Hulk not green in his first appearance (which is fairly common knowledge amongst comic fans), but his transformation is not triggered by anger. Instead, Banner transforms into a hulking grey beast at sunset, returning to his human form at sunrise. Oh, and the Hulk isn’t really an unthinking beast, either, he’s actually quite articulate. Indeed, this is a far more interesting tale then the traditional “Hulk Smash!” narrative. Stan and Jack combine elements from a number of classic monster stories…the Werewolf, Dr Jekyll and Mr Hyde, and Frankenstein’s Monster…to create a character that has proven to be just as enduring as them. I can also see an influence from classic 1956 science fiction movie Forbidden Planet here. The arrogant use of technology releases a monster from the scientist’s Id in both stories. 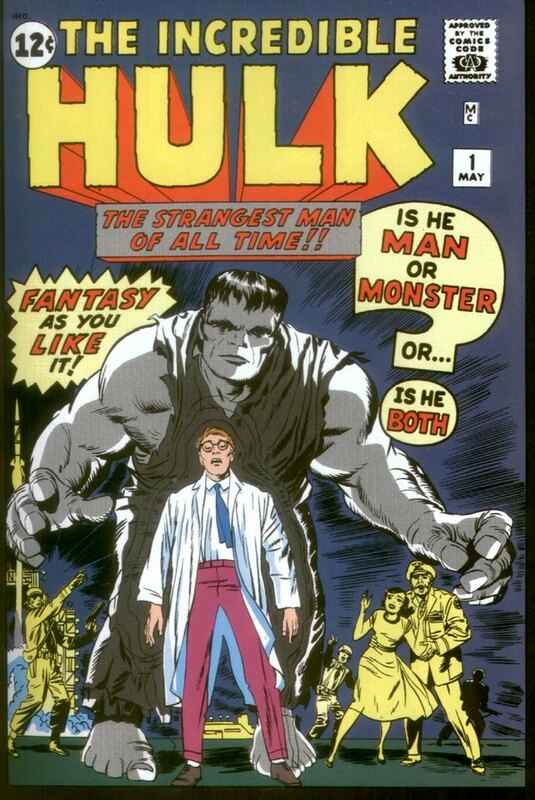 For that is what the Hulk is here, not simply Banner’s inner rage unleashed, he is the personification of his Id, as Freud put it, “the dark inaccessible part of our personality.” Banner’s very repressed and subtle attraction to Betty is revealed, when his Id is unleashed in the form of the Hulk, who is irresistibly drawn to her. Less interesting is the “it’s all a dastardly Red Commie plot” aspect of the story. “The Reds” were, of course, a common villain in 1960’s Marvel Comics, but read from a 21st Century perspective, this stuff is a little painful. Would a man named “Igor” with a clearly Russian accent have been employed by the US Military to work on a Top Secret weapons project? I suspect not. He’s possibly the worst spy ever, and it’s interesting to note that we never learn his surname…I suspect his full name was Igor Iamaspyski. Later on it’s clear that Stan and Jack are trying to say something clever about Banner releasing the human inside the monstrous Gremlin, after he had released the monster within his human self, but it’s all very rushed. The entire confrontation with the Gremlin in Russia, turning him back into a human, and him then rebelling against his evil Communist overlords (including him ranting to a picture of Khrushchev, or Comrade K as he’s referred to in the comic) takes place in the last two pages! Can you imagine that much story being packed into two pages in a modern comic? Anyway, subtle this is not, and it really doesn’t seem to fit with the rest of the story. I guess I should mention that this comic also introduces eternal sidekick Rick Jones to the Marvel Universe. Rick is extremely irritating and, I’m sad to say, this is by no means the last we’ll be seeing of him. Indeed, he will later play a big part in the founding of The Avengers, will play a pivotal role in the Kree/Skrull War and has continued to be the Marvel Universe’s prime hanger on right up until the present day. It’s possible I may grow to love Rick Jones as I read more comics that feature him. It’s also possible that I won’t. Lastly, I have to mention the art, which is simply breathtaking in places. The three panels at the end of Chapter One, showing the Hulk walking off into the distance are incredibly atmospheric, and showcase Jack Kirby at his best. 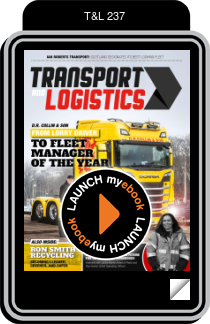 Hey, wow, look at that cover! How exciting is that? 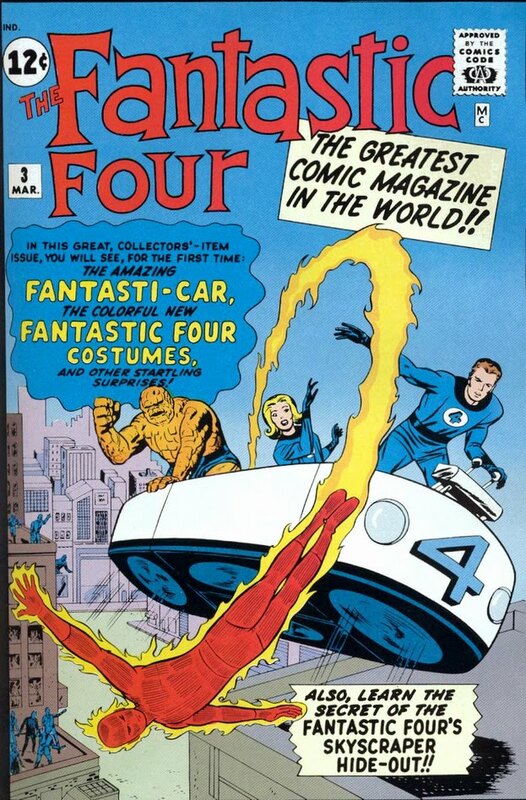 We have the Fantastic Four in their distinctive costumes at last, we have the Human Torch looking like the Human Torch (and not his Golden Age equivalent), and we even have the Fantasti-Car. From a design perspective, this is great; the red and yellow Human Torch simply leaps out at us when compared with that striking, blue background. There’s something missing from this cover, though, and that the villain of the month. There’s a good reason for that, the villain in this story is the Miracle-Man and he is, quite simply, rubbish. Indeed, he’s little more than an excuse to get the Fantastic Four fighting a giant monster again! Not only is the Miracle-Man rubbish, but this story really makes little or no sense. At the risk of spoiling this nearly fifty year old comic, it turns out that the Miracle-Man isn’t capable of performing miracles at all, but is just a very talented hypnotist…so talented that he can hypnotise television cameras into broadcasting images of events that aren’t really happening? Also, apparently, the police in this still unidentified city regularly carry bazookas in case of giant monster attack. I got excited at one point as Stan and Jack have the Invisible Girl go off to take on the Miracle Man by herself after the men on the team have resolutely failed to defeat him. She even thinks to herself, “One Invisible Girl can sometimes accomplish more than a battalion.” For a moment I thought we were going to see something really progressive, that we were going to see Sue Storm strike an early blow in the battle of the sexes and prove herself to me a feminist icon. But, alas, no, all she does is get easily captured and allows herself to be manipulated into luring the men of the team into a trap…who then have to save her. I’m not the first commentator to lament the obvious subtext of making the team’s female character the “invisible” one. It’s not all bad though. As I said, we see the debut of the team’s distinctive blue costumes, and Stan and Jack have some fun the absurd idea of putting The Thing in a costume. The Human Torch also gets his now familiar traditional look, setting him apart, visually speaking, from the Golden Age character of the same name who first appeared in Marvel Comics #1 in 1939. Interestingly this new look is not explained within the comic. For example, it’s not suggested that this is the result of him gaining greater control of his powers. Indeed, in a flashback recounting the groups origins we see that the Human Torch has always looked like that. What we have here, people, is the Marvel Universe’s very first retcon. (Note: for those of you who maybe don’t know what a “retcon” is, the term is shorthand for “retroactive continuity.” Basically, a retcon is when you revise the established back story of a character). So, not a classic issue, but still a lot of interesting stuff going on here. Wow, things really kick off in this issue, which has continued to have ramifications right up until the present day in the Marvel Universe, tying in to such epic Marvel moments as the Kree/Skrull War and, of course, Secret Invasion. Stan and Jack show a nice flash of genius by opening up the issue with the Fantastic Four on something of a criminal rampage. From the point of view of reading this in 2010 it’s obvious that something is up…doppelgangers or maybe mind control…but this was only the second issue, and for all the readers at the time knew, this was the direction the characters were going to go in. However, of course, it’s quickly revealed that this isn’t the FF at all; it’s a group of shape shifting aliens called Skrulls. The Skrulls have possibly been the most significant alien race in the Marvel Universe, with only the Kree and the Shi’ar coming close to matching their importance. This issue also reveals that the Fantastic Four have a flagrant disregard for the rule of law. When wrongly arrested for the crimes that the Skrulls have committed in their name, our four heroes think nothing of immediately breaking free, rather than trusting in the justice system to clear their name. Of course, it would make for a rubbish story if they were just content to remain in their cells, but it’s interesting that this moral quandary doesn’t trouble any of them for even a moment. So, you like Deadpool? You like all that quirky meta-textual stuff? Well, Stan and Jack were doing that right here in the second issue of Fantastic Four. Mr Fantastic uses panels clipped from contemporary Marvel monster titles, Strange Tales and Journey Into Mystery to trick the leader of the Skrull invasion force, establishing that Marvel Comics exists within its own fictional universe. This is an in-joke that we’ll see returned to again and again, and which was used to great effect by Peter David in the recent She-Hulk series. This issue also sees the bond between the four main characters begin to deepen. While The Thing continues to express anger and frustration at his transformation, which leads to conflict within the group, we do see both Reed and Johnny express a deeper level of understanding when it comes to the emotional pain that Ben is feeling. Jack Kirby’s art really shines in the issues most poignant moment – after a second trip through the cosmic rays that bombard the Earth, Ben reverts temporarily to his human form. Kirby’s portrayal of his transformation back into The Thing is incredibly touching, and there is a very tangible sense of sadness and pathos, particularly in the final panel of the sequence, where Ben looks utterly defeated. Still no costumes, and Johnny still looks like the golden age Human Torch, but this issue shows a big step towards that special formula that made Marvel such a revolutionary force in comics. 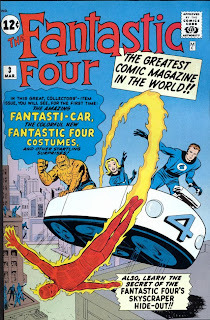 Well, I thought it would be interesting to read through every Marvel comic in chronological order and record my thoughts on each issue, starting with the comic that heralded the beginning of the Marvel Age of comics, Fantastic Four #1, by Stan Lee and Jack Kirby. These won’t be reviews, this isn’t scholarly analysis, this is simply my musings as I read through Marvel history. Fantastic Four #1 is a fairly fascinating read, the view is generally that Stan and Jack completely reinvented comics with Fantastic Four #1, and the Marvel style of comics was fully born with this issue, but that’s simply not true. For example, one of the things that has always set Marvel apart from their Distinguished Competition is that Marvel’s comics are set in real world cities, unlike DC’s fictional cities, like Gotham and Metropolis. However, Fantastic Four #1 seems to take place not in New York but in “Central City.” It’ll be interesting to see how quickly in the run the setting changes to New York. It’s also fascinating to see how much everyone hates each other at first. Marvel’s “first family” are truly a dysfunctional family to begin with. Reed and Ben are quite literally at each other’s throats, and it’s clear that the animosity between them has been brewing for some time. Ben feels that Sue is in love with the wrong man, and the fact that he holds Reed responsible for his transformation into The Thing only fuels his hatred for him. It’s also interesting to note that our heroes at no point appear in costume throughout the entire issue. They are either in regular, civilian clothes, or in purple jump suits. The look and feel of the Fantastic Four is incredibly different to that which we’ve become accustomed to. The Thing looks very different to his classic orange, rocky form…he’s rounder, softer, almost as if he hasn’t quite set yet. The Human Torch, of course, is also very different, looking more like the original Human Torch from the thirties, then the later, more stylised version that we’re used to. 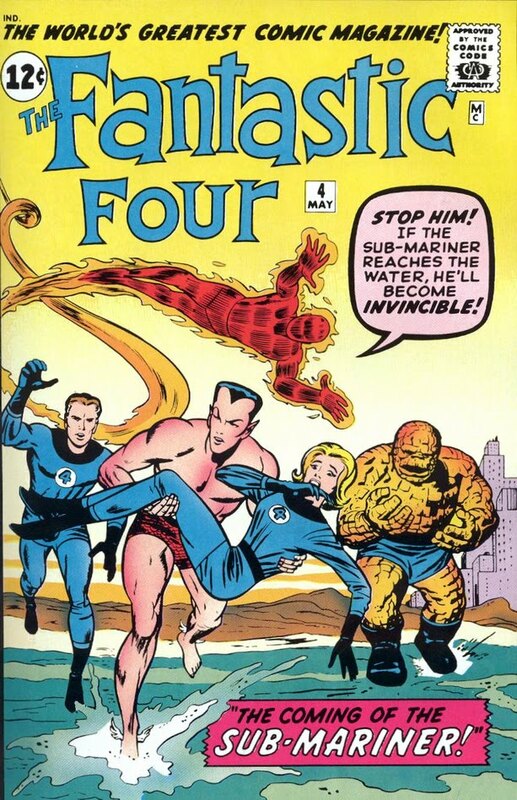 Another interesting point is that the scene that adorns the now legendary cover to Fantastic Four #1 simply doesn’t take place in the story at all. The fight with the Mole Man’s monster happens deep under the earth in the Mole Man’s lair, and not on a city street. The structure of the story itself is also worth noting. Lee and Kirby introduce each character and their powers before going back and telling us their origin in a flash back. Personally, I feel this is where most movie adaptations of super hero comics go wrong, including the Fantastic Four movie itself. We don’t usually get to see the characters in action until well into the movie, suffering through an interminably long explanation of their origins. Wow me first, show me the heroes in action, then go back and tell me how they gained their powers (if you must), don’t make me sit through an interminable origin story before showing me the hero in action (I’m looking at you, Batman Begins). Stan and Jack get it bang on here. Interestingly, rather than being a clean break from what had come before, Fantastic Four clearly shows itself to be a progression from the monster books that Stand and Jack has been working on before. We’re treated to a succession of giant monsters crawling out of holes to terrorise people. In many ways it is the monsters and not the drably dressed heroes who provide the visual entertainment here. Another thing worth noting is the battle with the Mole Man and his monsters itself, which, one has to concede, is incredibly unfulfilling. To summarize, the Fantastic Four track the Mole Man to his base of operations on Monster Island, fall down a hole, are then attacked my one of the Mole Man’s monsters, and then run away. The Mole Man then, for some reason, decides to blow up his island as they flee. The team don’t use their powers to cleverly defeat the Mole Man, they simply use them to flee. So, after their lamentable absence last year, it would seem that The Eagle Awards are back! For those of you who don't know, The Eagle Awards are the British comic book awards, which have been running (off and on) since 1976 (that's the year I was born, people!). They have, lately, been the subject of some controversy, but let's not get into that here, the important thing is that awards are shiny, and if there's one thing that people like, it's shiny things! Now, for the moment, they're just in the first round of nominations. This is the point where you, the comic loving public, can nominate anyone and anything in the 30+ different categories, those people/comics/whatever getting the most votes will then go through to the second round, gaining an official nomination. For the moment, in this first round, you can either write in your own nominations, or choose from a drop down list of people/comics/whatever that have already been nominated in that category. You are not limited to only nominating from the drop down list though. I've already voted, as have lots of people it would seem...please, go vote, and vote for whoever you want to! It's nice to see that people have already voted for Orang Utan Comics personnel and publications in eight categories though... I've already had votes for Favourite Newcomer Writer, Favourite Letterer and Favourite Editor. Azim Akberali (OUC's longest serving artist) shows up in the Favourite Artist: Fully Painted Artwork category (an award he received a proper nomination for in 2008, the last time the awards were held). Peter Rogers pops up in the Favourite Writer category. FTL has received votes in two categories, Favourite Cover Published During 2009 (for John Charles' fantastic cover to FTL #1) and Favourite British Black and White Comicbook. Alpha Gods shows up in the list for Favourite Graphic Novel Published During 2009 and Favourite British Colour Comicbook; and Orang Utan Comics shows up in Favourite Publisher. I doubt we'll win anything, but it would be nice to see us get through to the second round in some of these categories. So, go vote, have fun, vote for who you want to vote for...but if you like what Orang Utan Comics did during 2009 then it would be awesome if you'd vote for us and our comics! To vote, visit The Eagle Awards site here. Welcome to the Cyber Hellfire Club where I'll be discussing my writing and art and giving you an insight into my comic book work. An Elephant Never Forgets - Elephant Words ended on Saturday 30th July, 2016. Site creator Nick had a few words to say about that. - Art showcase. A buddy of mine helped compile some of my artwork into this neat little video. FTL #1 (OUC) Coming soon! The Doppleganger Chronicles Book Two (Tyndale House) Coming soon! AX Collection (Top Shelf) Coming soon!